"Fast, amazingly thorough ... Reveal(x) is a product with which many security operations center (SOC) teams could hit the ground running." Internal threat activities (privilege escalation, lateral movement, etc.) are difficult if not impossible to detect using endpoint and perimeter protection alone. ExtraHop Reveal(x) provides network traffic analysis that helps security analysts efficiently detect and investigate these late-stage threats, as well as proactively improve security hygiene. 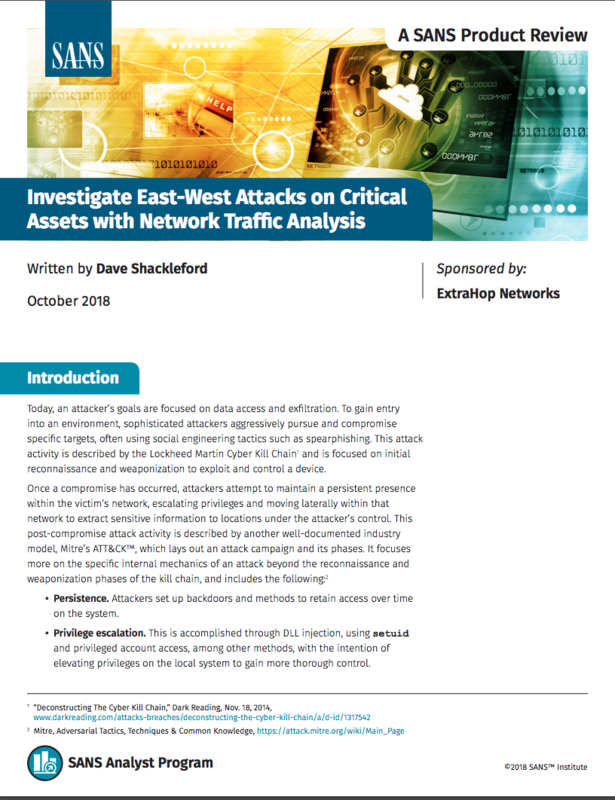 Read the report to learn why SANS Instructor Dave Shackleford says Reveal(x) "does [detecting and investigating threats in east-west traffic] well, and so much more," or listen to Dave talk through his review in person: Investigate East-West Attack Activities to Defend Critical Assets: A SANS Review.